I have become subversive. I have begun to say Merry Christmas in downtown Seattle, on airplanes, in the grocery store. I have no need whatsoever to be offensive to my Jewish friends, to Muslims, or to the ardent secularists who seek to control our public language. But I find myself puzzled why Christians have allowed ourselves to be so intimidated by this apparent mandate of language in our time. Yikes, heaven forbid that we might hear the word Christ in the public air. Just yesterday I received one of those many email holiday e-cards, this one from the American Council on Education, one of the important higher education lobbying organizations in Washington, D.C. On the card there is a lovely picture of the Capitol in D.C., framed by picturesque snow-covered trees. But surrounding the picture are these words: “We wish you peace, joy, hope, and fulfillment during this holiday season and throughout the new year.” At first I wondered if the message intended to suggest that peace, joy, and hope will come from the capitol of our nation. I hope not. But all of this is indeed puzzling. The language is straight out of the Christmas stories we find in the gospel accounts of the coming of the Christ child. And yet any trace of Christian content is totally expunged from the e-card. Isn’t it strange that we want to claim the heart of the Christian content — peace, joy, hope, fulfillment — but we insist on airbrushing out the source of that content? This is the coming of the Prince of Peace. 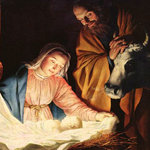 It is the long-awaited Messiah who brings hope of deliverance to his people and to the world. In him is life, says John, the light of the world that shines in the darkness, and the darkness will never overcome it. In him is the source of hope and joy and peace and ultimate fulfillment. Thoughtful Christians know that we live in a pluralist society. We enter into the marketplace of ideas about what is true and good and beautiful, and we know we must make our case along the way. But it is a free marketplace, and we need to claim our spot. And in this Christmas season we want to remind those around us that we ponder in our hearts the true source of joy, peace, hope, and fulfillment. And so, subversive as it may sound these days, Merry Christmas to each of you in this beautiful season of wonder and joy. Well said!! Thank you for your article. My niece graduated from SPU a couple of years ago. Merry Christmas! Awesome thoughts about letting the words of our mouths and the meditation of our hearts be acceptable in the sight of our Lord, our Rock, and our Redeemer….